6. Provide up to 42 gallons of clean water, advice change each 2months. 7. Compact design fits easily into most refrigerator doors. 8. Locking flip-top lid for easy refills. 9. Smooth basic handle for easy pouring. German food contact and food quality mark,UK standard of performance test. Bluetech filtered water,can filter the heavy metal and limescale in tap water,say goodbye to limescale forever.More delicious foods,better taste soup,better taste water. Bluetech water filter pitcher,filter the tap water directly,after purified by smart filter cartridge,the heavy metal and chlorine in water had been filtered,retain the helpful mineral substance to babies. With Bluetech filtered water,your tea can be more clear and better taste,bring better joy to your life. 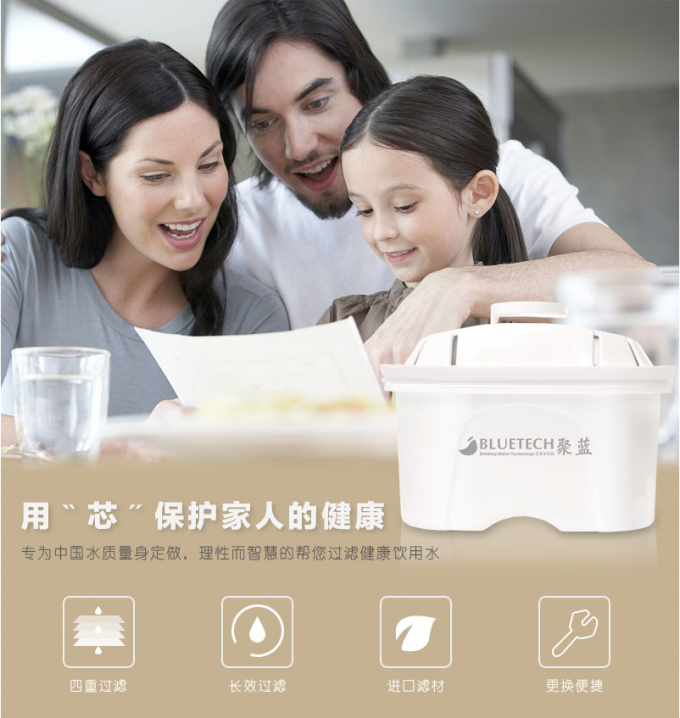 Bluetech smart filter removes the odor and harmful substance like chlorine,heavy metals and contaminated things in water,at the same time it reduces the hardness of water,reduce the PH into medium,re-nature the water.With great taste water,just like spring,it’s the best choice for tea. 5. With a timer indicator which can remind you to replace the cartridge in time based on drinking people number. 1. Rich experience in the drinks and beverage industry. 3. Strict inspection team and third party inspection service. 7. Good after sales service and 1 year warranty. 1. 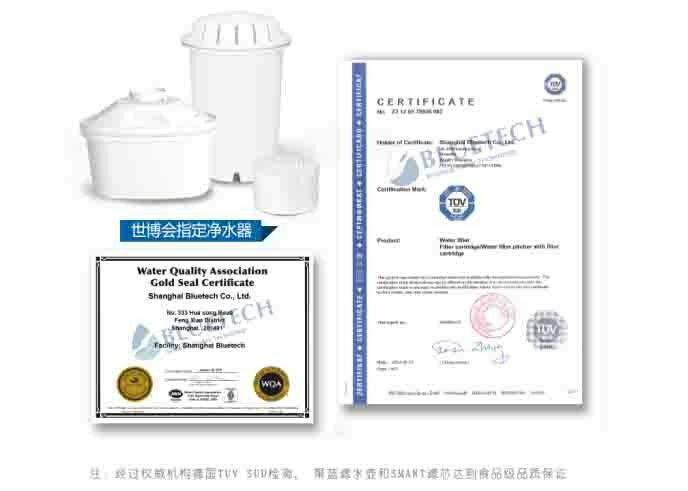 We owned our own professional lab,and all the equipment for testing filters.We will test the quality of every batch of goods under the standard of WQA and TUV. 2. Our own mould room,to ensure the mould working correctly.And can customize your own design if you have high volume quantity. 3. More than 30 sets of injection machine. Large capacity of producing. 4. More filter choices.Filters suits Europe,Filters suits USA,Filters suits Asia water...Different filters for different market. 5. Working with most famous clients in Europe and USA,and also in China.Have related auditing from most clients.